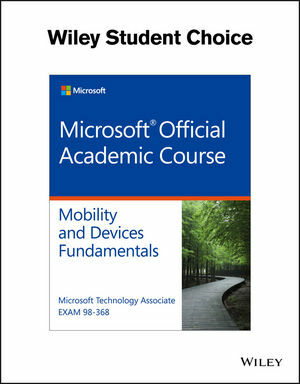 Exam 98-368 MTA Mobility and Device Fundamentals measures your ability to accomplish technical tasks such as understanding device configuration; understanding data access and management; understanding device security; understanding cloud services; and understanding enterprise mobility. Students who are beginning studies in technology need a strong foundation in the basics before moving on to more advanced technology courses and certification programs. The Microsoft Technology Associate (MTA) is a new and innovative certification track designed to provide a pathway for future success in technology courses and careers. The MTA program curriculum helps instructors teach and validate fundamental technology concepts and provides students with a foundation for their careers as well as the confidence they need to succeed in advanced studies. Through the use of MOAC MTA titles you can help ensure your students future success in and out of the classroom. Students will learn to configure and secure Windows devices, access and manage data (including cloud storage), learn basics of Microsoft cloud services (including Microsoft Azure and Microsoft Intune), and learn about enterprise mobility including Bring Your Own Device policies.